Whether you’re trying to lose weight or stay fit, you know how challenging it can be to stay healthy in today’s busy world. We’re constantly on the move, and we don’t always have time to cook. That’s where Garden of Life’s Raw Organic Meal Replacement comes in. This supplement delivers a balanced mix of clean protein, vitamins, minerals, fiber and probiotics. But is it worth buying? Can you really make the best organic meal replacement shakes with this supplement? Why Choose Raw Organic Meal? You’re always on the go, but you still want to eat healthy. Fast food isn’t even an option. Garden of Life’s Raw Organic Meal replacement shakes give you everything your body needs to stay healthy and energetic. Raw Organic Meal is loaded with 44 superfoods. It’s all vegan. It’s all non-GMO. And it’s 100% convenient. Did I mention you get all of these nutrients at just 115 calories per scoop? Raw Organic Meal sounds like a great supplement, but what’s in it? Before we talk about the ingredients, let’s look at the impressive nutritional profile of this supplement. All in all, this supplement offers a very balanced nutritional profile. Now that you know the nutritional profile of this supplement, you’re probably wondering what ingredients are in it. Raw Organic Meal contains six blends: Protein, Fiber, Flavor, Fruits & Vegetables, Greens, and Probiotic and Enzymes. Each one contains a variety of raw foods, and all of them are organic. All grains are sprouted for easy digestion. In total, these ingredients help provide 7g of fiber: 1g soluble and 6g insoluble. There are four flavors of this supplement, and each contains different flavor blend ingredients. Along with nutritious fruits and vegetables, this supplement contains a blend of super greens to jumpstart your energy levels and give you a high dose of nutrients. With this blend, you get 1.5 billion CFU of beneficial probiotics. Probiotics help replenish the good bacteria in your gut to improve digestion. Raw Organic Meal is loaded with superfoods, clean protein and probiotics. As a balanced meal replacement, you can take this supplement any time you want. Don’t use this supplement as a complete meal replacement. You need more than just a few hundred calories a day. In fact, if you cut too many calories, you’ll put your body in starvation mode and will find it even harder to lose weight. You should still be eating regular meals. 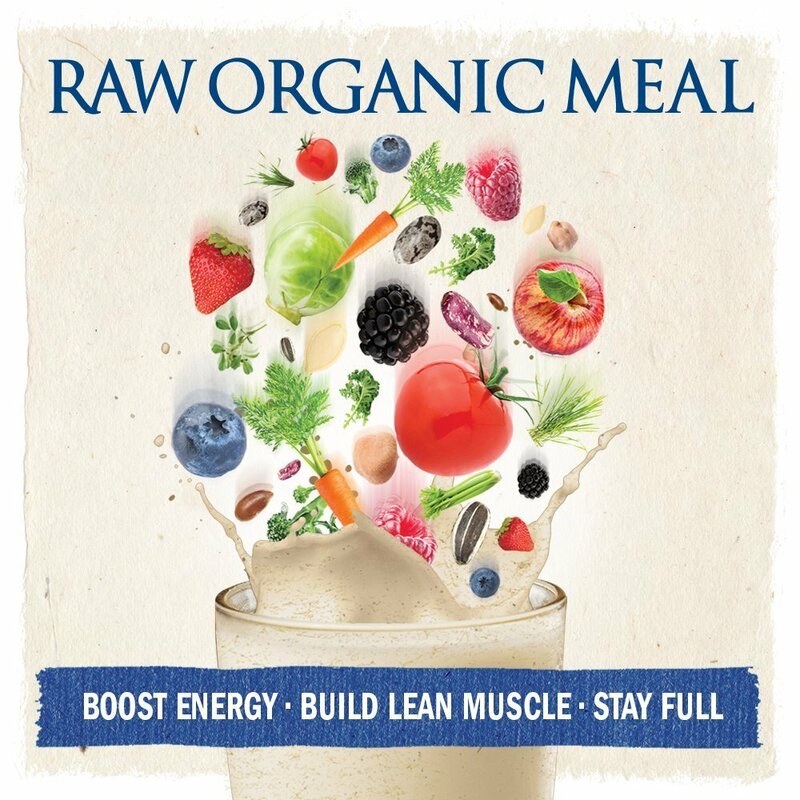 But if you’re having issues with snacking or want a better post-workout shake, Raw Organic Meal may be a great option for you. To enjoy your shake, just mix two level scoops with 16 ounces of water or non-dairy milk. Each large container provides 28 servings. Garden of Life’s Raw Organic Meal replacement shakes taste great and are loaded with health-promoting ingredients that will give you more energy and help you stay fuller for longer. If you’re looking for a simple way to get the nutrients you need, this supplement is a great option.